The next Summer Olympic Games, in 2020, will be in Tokyo, Japan. But what about the Olympics in 2024 and 2028? The International Olympic Committee and the cities of Paris and Los Angeles, California made a decision on Tuesday. They agreed to meet in September to decide which city will host the games in 2024. They also could decide which city will host the games four years later. If the cities can agree on who will go first, the IOC will not have to make another Summer Olympics decision for several years. The mood of officials taking part in the meeting appeared good, according to the Associated Press. Paris has been discussed as the favorite to host the 2024 event with Los Angeles hosting four years later. Why is the decision surprising? In the past, choosing who hosts the Olympics has been very competitive. The 2016 Olympics was awarded to Rio de Janeiro, Brazil in 2009. The campaign was described by some reporters as “high-stakes.” That means there was a lot of pressure to win. World leaders and famous people all made their case for why their country should host the Olympic Games. In 2009, President Barack Obama and basketball star Michael Jordan traveled to Copenhagen, Denmark for the final vote. They were supporting the effort of Chicago, Illinois to be the host. When Rio de Janeiro was awarded the 2016 Olympics, people celebrated. The Brazilian city won the vote over Chicago, Madrid, Spain and Tokyo. The head of the IOC is Thomas Bach. He came out of a meeting Tuesday holding the hands of Los Angeles mayor Eric Garcetti and Paris mayor Anne Hidalgo. All three seemed happy. 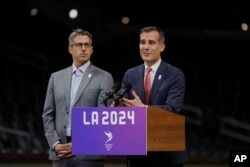 Los Angeles mayor Eric Garcetti makes a presentation related to the city's bid for the 2024 Olympic Games. If they do not reach an agreement by September, there will be a vote in Lima, Peru. That vote would decide only the host for the 2024 games. There was a lot of worry leading up to last year’s Olympics in Rio de Janeiro. Many were concerned about the Zika virus, polluted water and unfinished stadiums and housing. Bach said he thinks awarding two Olympics at once will ensure a stable future for the Summer Games. If Paris receives the 2024 Olympics, it will be the 100th anniversary of the last time the French capital hosted the games. Los Angeles last hosted the Olympics in 1984 and the last Olympic Summer Games in the U.S. were in 1996. If the cities can agree, it could become a busy time for Los Angeles. The United States, Mexico and Canada are competing to host the 2026 soccer World Cup. Many games would be played in Southern California if the U.S. is chosen as the host. Dan Friedell wrote this story for VOA Learning English based on a report by the Associated Press. Mario Ritter was the editor. Will you visit the Olympics in 2024 or 2028? We want to know. Write to us in the Comments Section or on our Facebook page.